Through my work at MonkeyMedia Software , I’m inspired to write this essay to address the ongoing confusion, distress, frustration and communication disconnect that I often see inside many franchise systems that I work with, when it comes to growing catering sales on top of current franchisee assets. I feel obligated to share these thoughts with our restaurant community, because I have been very fortunate to not only come to understand the business challenges, but in fact, I have been given the opportunity to solve for these business challenges through my work in the restaurant industry. I am not trying to lay blame on these issues. I simply wish to bring visibility to the reasons why I think things might be the way they are when it comes to growing catering sales, and I wish to propose a solution or perspective that perhaps we may not have considered. I hope you will send me your thoughts on the subject matter below. It’s no big secret that the franchising model for growing restaurant companies continues to be a key driver in our industry. Just look around. 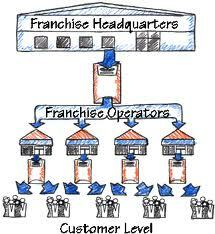 Everyone is franchising. After all, who wouldn’t want to collect an ongoing annuity based royalty for the licensing of valuable intellectual property? The restaurant industry is no different from the music industry, the movie industry or even the software industry. It’s an industry full of creativity, processes, proprietary flavors and culture. It only makes good business sense to leverage those items across the globe . At least, it looks that way on paper. It’s easy, right? The plan is critical. A franchisee is an important animal in the restaurant industry. Why?